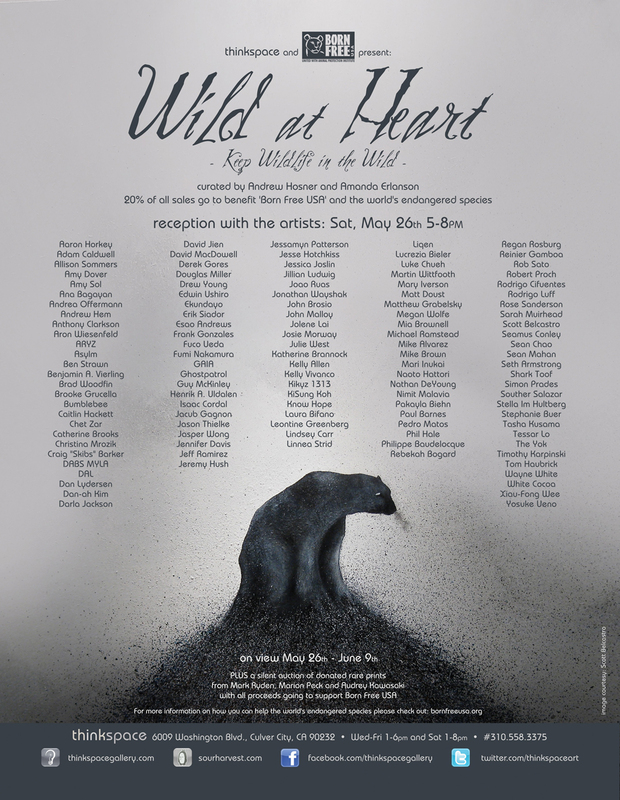 Thinkspace is proud to present “Wild at Heart: Keep Wildlife in the Wild,” an exhibition to raise awareness about the precarious predicament of wild creatures around the world, and to benefit efforts to protect them in their natural habitat. Featuring a stellar cast of more than 100 artists from all corners of the art world, this exhibition brings together some of the most profound and innovative voices making art today. 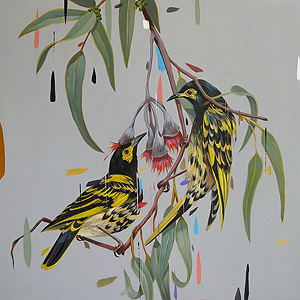 In recognition of the imperiled state of much of the world’s wildlife, each artist will apply their own unique perspective to our relationship with the fascinating creatures with whom we share our planet. As the natural world becomes increasingly impacted by shifting climate, human greed and diminishing resources, protecting those creatures that still roam free becomes ever more vital to the soul of humanity. For even if we could continue to exist without wildlife, the spirit-crushing sadness that our species would take upon itself would surely rob all joy from life. Those majestic, miraculous, elemental beings which we admire from afar are at the root of who we are as people — from the woodland protagonists of our childhood storybooks, to the metaphors we use to describe ourselves as adults, to the animal spirits that visit us in our dreams. As we take steps to protect them from those who would rob them of their freedom, we also improve our own species’ chances to persist far into the future, both by preserving the natural world we all share, and by cherishing the sacred genesis of our imagination and symbology. In appreciation of the magnificent creatures with whom we share the planet, Thinkspace will donate 20% of the sale price of each piece of art to Born Free USA and the Animal Protection Institute, which operate jointly as a non-profit organization that advocates worldwide for the ethical treatment and protection of wild animals, and also maintains a large sanctuary for rescued primates. To honor the animals closest to our hearts, the gallery will be accepting donations of old blankets to donate to area shelters so dogs don’t have to sleep on cold hard concrete, as well as other used and new pet supplies. The opening will feature the release of a gorgeous limited edition screenprinted poster especially created for the exhibition by the incomparable Aaron Horkey. We hope you will join us on May 26th to celebrate and defend the wild things that fill our lives with wonder and mystery.